Overseeded with rye for winter green color! FOR USE ON LANDSCAPES, GOLF COURSE TEES and FAIRWAYS, LAWN BOWLING GREENS and TENNIS COURTS, and SPORTS FIELDS. 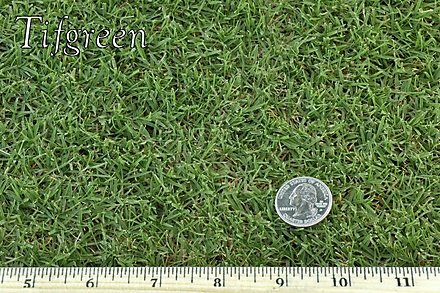 Tifgreen 328’s wide range of mowing heights, and low, dense growth habit make it one of the most versatile hybrid bermudas. Tifgreen combines very fine texture with beautiful green color. It overseeds well, and has fewer pest and disease problems than cool-season grasses. It thrives in the warmer climates of Southern California. Like all our hybrid bermudas, Tifgreen 328 is a drought tolerant grass, and requires very little water compared to cool season grasses like fescue.